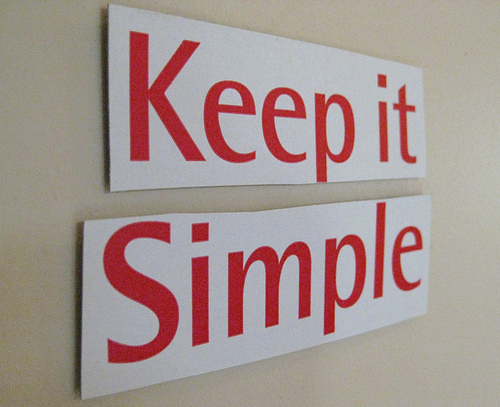 Here is the second installment of Keep It Simple. In this post, I will be giving short summaries of some of the articles I had posted previously, together with the key lessons from each article. There is a lot of controversy in the field of nutrition on what type of a diet you should have and what you should eat. Recently there has been a rise in many types of fad diets promoted by different gurus. You do not need to follow any of these diets to be healthy, but should be mindful of what you eat. There are a few basic principles to keep in mind when choosing what to eat. The keyword behind all these principles is balance. I did 3 articles on the three main macronutrient types that you need to eat and several other articles looking into related topics. These articles summarize all the basic things that you should know about your diet and can help you in forming your own eating strategy. This strategy will depend heavily on what your goals are. For most people, carbohydrates form the largest part of their diet. Their primary role is to deliver energy to the body. This energy is delivered primarily in the form of glucose, which is the basic fuel for the human body. It can come in its simple form, delivered as a simple sugar and thereby getting released into the bloodstream really quickly, or it can come in its more complex form, for example as a starch (chains of glucose branched together). This glucose is either used up by the body to fuel its functioning or it is stored as glycogen. Glycogen storage is rather limited however, and so excess glucose often gets stored as fat. Carbohydrates have recently become a bogeyman, and have replaced fats as supposedly the main culprit behind the obesity epidemic in the Western world. This has given rise to a number of low-carb diets such as Paleo or Atkins. However, these types of diets have often been criticized by different people, stating that they are based on bad premises and carbohydrates are not the bogeyman that it is often portrayed as. Key Lessons: Carbohydrates are an essential part of the diet and should be eaten. The amount of carbohydrates and when they should be eaten depends on what your goals are (lose weight, gain weight) and your activity levels (for example long exercise and long-distance running). So if you are trying to gain weight, having a large number of carbohydrates in your diet may help you. Good sources of carbohydrates for someone trying to gain weight are brown rice and sweet potatoes. On the other hand, for someone trying to lose weight, you might try to cut down on the amount of carbohydrates. The strategy once again is different for active people. Carbohydrates are basically the fuel for the body and so for active people who do long and demanding exercise or activities (such as long distance running), they might need to also take in more carbohydrates, before, during and after exercise. Proteins serve as the building blocks for your body. The amino acids that they contain are recomposed and then incorporated in many bodily structures, for example muscles are made of protein. That’s why if you want to build muscle, you need to ingest protein. Some of the amino acids that make up different types of proteins are called essential amino acids. This means that your body can’t manufacture them and needs to ingest them from the outside through food. Key Lessons: As proteins are the building blocks of muscles, your diet needs to have a significant amount of protein in it, in order to be able to make muscles grow. You especially need to make sure to provide your body with the essential amino acids, because it can’t manufacture them by itself. While the majority of the proteins you ingest should come in the form of normal foods, there are some supplements that can be used to supplement your protein intake. This is to make sure that you have enough protein in order to build muscle, especially after a workout. There are different types of protein supplements, for example egg protein or soy protein, however the most important protein supplements come from cow’s milk. The two main types are whey protein and casein protein. These are sold in powder form and can be mixed with milk or water to create a liquid which you can drink. Whey protein is absorbed by the body fast, while casein protein is absorbed slowly. Key Lessons: Since whey protein is a fast absorbing protein, you should take it straight after working out. That way you supply your body with building blocks needed to build muscles. Casein protein is a slow absorbing protein and the best time to take it is before going to bed. That way it can release those amino acids during the night and help you grow bigger. Fats are the third major macronutrient needed by your body. It is a much maligned nutrient, however it plays very vital roles in many bodily functions. Fats are very important, especially because of the fact that they contain some essential fatty acids, which your body cannot produce and which need to be obtained from the outside. Some very well-known fatty acids are omega-6 and omega-3 fatty acids. Fats can be divided into saturated fats and unsaturated fats. Traditionally saturated fat has been considered an unhealthy fat, while unsaturated fat is considered healthy, but recently more and more people are stating that saturated fat should be an important part of your diet. There are some fats that are considered very unhealthy and those are trans-fats. Key Lessons: Fats are an important part of any diet. They are especially important if you want to gain weight. They should compose around 20-30% of your diet. However don’t gobble down any type of fat. Try to eat “healthy” fats from natural sources such as fish oil or avocados. These are sources of essential fats and have positive benefits for your body and health. Omega-6 and omega-3 are a types of fatty acids, the building blocks of fats. They are both very important for our bodies and are considered essential. However due to the rise of the modern diet, there is a huge imbalance between the amount of omega-6 fatty acids and omega-3 fatty acids. Sometimes the ratio is 10:1 or even 20:1 in favor of omega-6. This can have a lot of negative effects on our bodies. There is a bit of a controversy on how important this ratio is, with some arguing that it is very important and needs to be addressed, while others don’t give the ratio much importance. What everyone does agree on is the fact that omega-3 fatty acids are very important and need to be eaten. The main sources are seafood, fish and marine algae. You can also supplement it by taking fish oil supplements. Key Lessons: You need to make sure to include a lot of omega-3 fatty acids in your diet in order to be more healthy. You should also cut down on eating too many processed foods. The articles on hydration and electrolytes are related, and the key message here that your body needs to keep a balance between fluids and electrolytes. Drinking water is one of the basic things that you need to do every day. Your body needs water in order to function. That’s why it is very important to stay hydrated and to keep constantly replenishing your fluids. This is especially important if you want to gain weight and muscle and generally if you do any type of exercise. When exercising, your body raises its temperature and so in order to cool down, it starts releasing sweat, which is primarily composed of fluids. So in this way your body is losing fluids fast and needs them to be replenished. Key Lessons: Remember to take in fluids throughout the day, especially by drinking water. When you are exercising, your fluid intake should increase. Many bodily functions require electrolytes to function. Since electrolytes are electrically charged, they are used by the cells to maintain voltages and to carry electrical impulses. The carrying of electrical impulses is what is behind for example muscle contraction and also nerve impulses. Electrolytes are also important in the distribution of fluids throughout the body. Electrolytes go hand in hand with hydration. The amount of water and electrolytes in the body needs to be in balance. If there is too much water and too little electrolytes, then problems will arise. If there are too many electrolytes and too little water, then other types of problems will arise. Key Lessons: If your exercise is long and intense, then you should be replenishing your electrolytes (during and after the exercise). If your exercise is short and easy, then you do not really need to replenish electrolytes, as at this point you should concentrate only on staying hydrated. The standard to guide yourself by is that exercises that last longer than an hour require a replenishment of electrolytes, while those that last less do not. However a lot also depends on the intensity of the exercise and also whether you are training at altitude or not. Let your body guide you, if you are getting cramps, then it might be time to get some quality electrolytes in. The official introduction of beer time! This is a bit of a light hearted article on drinking beer. Here I introduce the concept of “beer time”. I noticed that every time I am on those elliptical sliding machines, I burn 150 calories every 15 minutes. The average beer is around 150 calories. So every time you spend 15 minutes on one of those machines, you burn the equivalent of just one beer! So think about that when you are going out boozing. Key Lessons: When going out boozing, try to count the amount of beers you drink in beer time. Remember that beers are mostly empty calories and will only help you gain fat, especially in the belly. So for each beer you drink, you need to spend 15 minutes doing cardio on an elliptical sliding machine. Hopefully that will keep your boozing in check.